“The difficult part is to maintain the struggle, the easy part is to attract workers”, states Simona Silva, speaking about the role of pedagogy and political training in the struggles of Brazil’s Landless Rural Workers Movement. Simona Silva, the pedagogic and political coordinator of the MST‘s national school called Florestan Fernandes, gave a round of talks across the Spanish state last May. We attended one of these talks in Barcelona and afterwords had the opportunity to talk with her. This post shares our reflections on the way pedagogy is central for MST’s political actions. The Movimento dos Trabalhadores Rurais Sem Terra (MST) is one of the largest and most dynamic mass-based political movements worldwide. It was born in 1984-85 to nationally coordinate the struggles for land being held since the 1960s by the rural poor. At the roots of those struggles was rapid industrialisation and agricultural modernisation initiated during the dictatorship (1964-1985) and boosted afterwords, forcing millions of people to migrate to the cities and to northern Brazil. The MST embodies a popular, transformative and anti-capitalist political project for the whole of Brazil. Its long struggle for land redistribution, social equality and the social function of the land is still pertinent today. Over the years, the MST developed its struggle hand in hand with the Workers’ Party (PT). However, when the PT entered into the government and choose to favour land owners, agribusiness, transnational corporations and exports rather than land reform, family farming (which produces 85% of Brazil’s food) and social rights, both organisations diverged. The MST is clear about maintaining its autonomy from institutions to be able to pressure and enter into conflict with the government when needed. As an example of that autonomy, entering the government means the impossibility of becoming a leader of the MST. A prime line of action of the MST has always been the squatting of “unproductive land” in the hands of big land-owners to establish self-organised agricultural settlements. In parallel, they organise urban mobilisations and several forms of direct action (e.g. invasion of GMO laboratories) to make visible and connect their struggle to public opinion. Turning squatters into social and political activists is one of their main challenges as self-organisation, militancy, consciousness and change of one’s self everyday practices are fundamental for moving forward the MST’s emancipatory project. Education is central for the MST. Each settlement (squatted land) has a school providing classes and enabling debates on issues such as food sovereignty and the nature of capitalism. At the regional level, the MST’s schools are more oriented to the study of the territory where the settlements are. At the national level , the Florestan Fernandes school trains political cadres that assume organisational responsibilities within the movement. The training given by the MST has the objective of 1) making people conscious that they are social subjects that have been produced by the capitalist relations of exploitation and oppression, and, therefore, share among them an identity of class; 2) working on their self-esteem and connecting the settlement’s struggles over the territory with past struggles; 3) providing continuous educational resources for the members of the movement and progress the struggle both in ideological and material terms. It is important to note here that squatters are the poorest and most socially marginalised strata living in the cities of Brazil. Simona explained how people initially join the movement because they want bread, housing and work and how important it is to provide them other basic resources such as self-esteem, mutual respect, dignity and literacy. Training is based in the Marxist methods of dialectics and historical materialism, as well in humanist values. Whereas the previous provides tools to comprehend capitalism and how it works in different geographies and transverse the whole of society, the later focus in human relations and culture addressing issues such as women oppression and youth. Internationalism is also an important aspect of the training as, besides learning from other experiences, the movement needs international solidarity to face repression and, especially, it is aware that its struggle is interconnected with all the other worldwide struggles against exploitation and oppression. This is why the MST is very active in the transnational peasant movement La Via Campesina and other international movements. These open possibilities for the MST go beyond its “particular” spaces of struggle. For the same reasons they organise international brigades in 14 countries, mainly in Latin America and Africa, to support the livelihood of peasants (water infra-structures, seeds reproduction), build schools and provide political training. Raising awareness on the social condition of women under capitalism and changing everyday life practices is very important for the movement. They deal with gender oppression from a class perspective, implying an understanding of both women’s liberation and class struggle as inseparable. Therefore, they combine issues such as care and self-esteem, the promotion of the political participation and leadership of women, and the maintenance of both formal and informal spaces of debate. “Whoever strikes a woman is expelled from the movement”, says Simona. But MST’s action goes much further. All settlements have two coordinators, one man and one woman. Meetings have spaces for childcare, its schedule is adjusted to women’s times, and in some the participation of women is mandatory. The MST organises campaigns on the physical and moral violence against women, and calls for an equal sharing of domestic work against women’s double and triple workday. Women self-organise in autonomous spaces as they experience oppression in particular ways. Training has always a component on the social condition of women and explains the history of women in revolutionary processes. Women also assume an active role in the movement’s actions, for instance, by being in the forefront of civil disobedience actions as by law police cannot beat women. Simona also explained the importance of “beautifying” the settlements and collective spaces, and of creating “mysticism” through art and music, to create good surroundings and vibrations within the movement’s spaces of community. 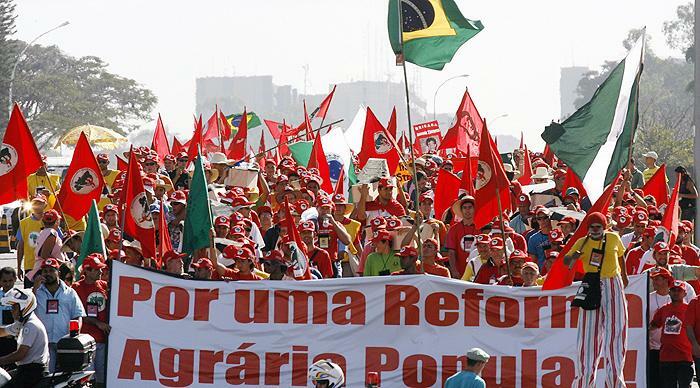 The slogan of MST is to “produce food for Brazilian society”. When they squat “unproductive” land they are fulfilling the social function of land: producing food for the population, as it is defined in the Brazilian constitution. “Unproductive” land does not correspond only to vacant land, including also land with monocultures for exports and transgenic commercial forestry. Nowadays, the movement promotes agroecology as its technological matrix, but this was not always the case. Since the beginning some argued that agrotoxics had negative impacts for both human health and the environment, while others defended that without them it was impossible to produce enough food. With the growing use of agrotoxics and transgenics by capital it was no longer possible to confront ruling powers with the argument that small-scale farmers are better because they have a low intensive use of those same technologies. The questions that arose were: food for society with or without poison? To sustain biodiversity or not? This would also allow the MST to gain broader societal support and to reform the movement’s morals. In all the settlements at least one parcel of land has to be based on collective work and agroecology, which serves as example for the rest of people and settlements. In general, according to Simona, those who opted for agroecology have had success. Nonetheless, she argues that it is important that people do it not because there are good market opportunities but by acknowledging that agroecology means healthy land and food and embodies an alternative to capitalist farming and its development model. Before squatting land, the movement and the future members of the settlement draw up a development project that establishes the level of production, the number of families, the type of structures and so on, and discuss what kind of settlement they want. Participation is highly important then and, Simona explains, usually requires long periods of time so that the movement has enough strength and political consciousness. The first thing the movement does after squatting is to put land in production and to construct the settlement school. This moment is also when the process of political training is more intensive to empower the collective. The MST simultaneously develops campaigns for society in order to counteract the criminalisation of squatting by the media and to ask for the support of people by purchasing and consuming their agricultural production. For Simona, it is fundamental that everybody feels part of the movement in order to maintain their autonomy and to keep the conflict and tension alive. 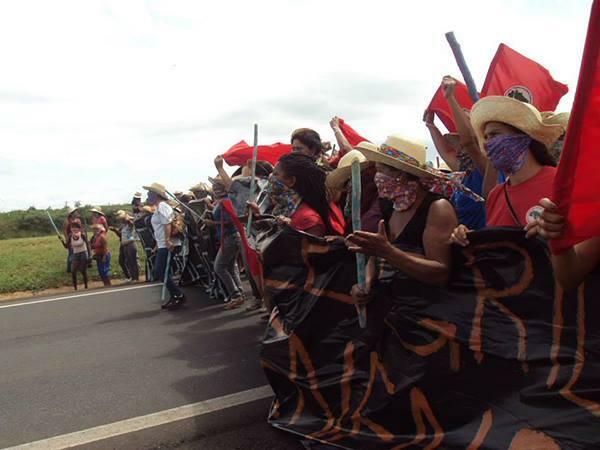 Over the years, the MST has been able to fight against the worst face of capitalism in Brazil and to give back dignity to those being dispossessed, exploited and oppressed. Their pedagogic work is an important piece of their everyday struggles and is the backbone of their political and emancipatory project. *Sara Mingorría is a PhD researcher at ICTA-UAB focusing on conflicts associated with the expansion of monoculture plantations (oil palm and sugar cane) in Guatemala and also works at an European project on global and local food assessment in Spain.